FCI Recruitment 2018 Job alert both Fresher and Experienced can get FCI recruitment 2018 updated on December 31, 2017 notification on recent FCI recruitment 2018 openings across India. This is an exclusive page updated on 31.12.2017 for the latest recruitment notification fci.gov.in from Food Corporation of India FCI 2018 it contains both active and recently expired Job openings and recruitment notification from FCI 2018. APPLICATION FEE & MODE OF PAYMENT Candidates belonging to General(UR)/ OBC category applying for recruitment to the above posts should pay Rs. 100/- (Rupees one hundred only) as application fee through online payment gateway system on www.recruitment.itbpolice.nic.in. 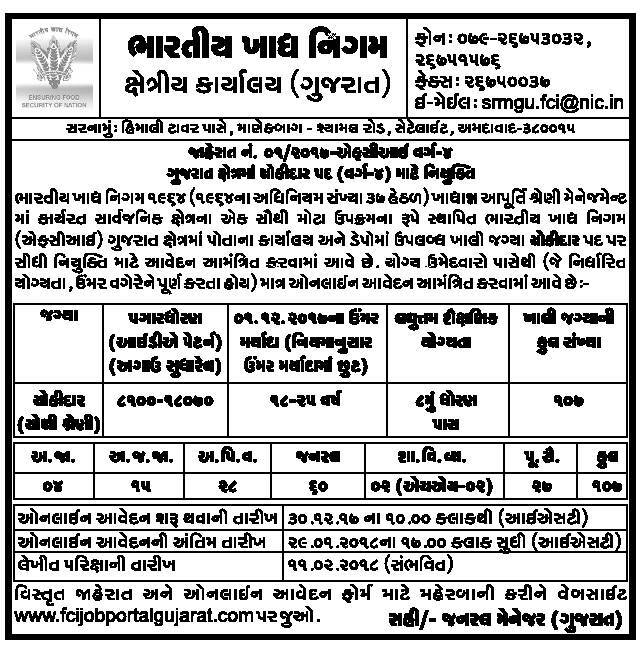 Eligible and interested candidates should apply only through website http://www.fcijobportalgujarat.com/. Candidates are advised to fill the application form after reading the instructions carefully. The application must be submitted ONLINE only.